The 2010 U.S. Chess League season opened with a new look. The league expanded, with three new franchises (Saint Louis Arch Bishops, Los Angeles Vibes, and New England Nor'easters) entering the league, the Tennessee Tempo departing, and the Queens Pioneers acknowledging they have nothing to do with the hometown of the NY Mets, rebranding as the Manhattan Applesauce. With more teams, the fights for playoff spots will be even more intense. Though prognosticating is the league's favorite pastime, predicting results with so much parity is extremely difficult. The first basic rule of the USCL is the limitation for each lineup to a 2400 average rating. You can't just whip out your four biggest guns. Successful teams often have one player who should be playing on a higher board. Because you can use a rating list that is one year out of date, players can be particularly under-rated. Last year New York won because few teams had an answer for fourth board Yaacov Norowitz, now rated 2500. [We certainly didn't; he scored 3-0 against New Jersey] Remember San Francisco, with Shankland on three and Naroditsky on four? Or Lenderman playing games on board three, and Esserman playing on board four? I don't know if this year will produce misfits like that group, but it could be a factor in the final standings. It's difficult to say what type of lineup is best. For some teams their roster dictates the strategy. Saint Louis has fielded triple GM rosters, but that means they are badly outrated on board four. Plus the best lineup is often not there when you need it, as any manager can attest to. Saint Louis has two players running off to the Olympiad, but often players on lower boards being unavailable can undermine a lineup. In the first round, New Jersey couldn't field the right combination of third and fourth boards, opening the door for an upset at the hands of the Philadelphia Inventors. So far, 2010 has been a good year for the balanced lineup. The Arizona Scorpions (4-0) and the New England Nor'easters (3 ½-1/2) are leading their respective divisions despite having no grandmasters on the roster. Both teams do have reasonable expectations on all boards, and so far everything has gone smoothly for them. Perhaps they will run into more difficult matchups in the last six rounds. Pretty much anything can happen at this point, and any team that can sneak into the playoffs will have a fair shot at making a run for the title. Coming off a breakout season (8-2) the New Jersey Knockouts had high hopes for this year. So far, matters have played out more like our first two seasons, with three frustrating matches out of four. We lost two matches to teams we look pretty good on paper against, Philadelphia and New England, and beat one of the scariest teams in the league, the defending champion New York Knights. We notched just one draw in three matches where I played and won, and won the match I didn't play. Things can turn around for us. We couldn't have expected Boris Gulko to continue his miraculous run of the last two seasons (8-0!) but he will certainly improve on 0-2 against lower-rated players this year. Our young fourth boards should start scoring points soon-they were a big key to last year's success. Time will tell. So far my own form and fortune has been pretty good, so I can proudly annotate my three games so far. Just a few days before the first round my opponent and I had done a chess camp together. The USCL gives you a good bit of time to focus on your opponent's style and repertoire. The Caro-Kann seemed like a good fit for the aggressive-minded Smith. I would also avoid any preparation he might have made for me. 3...Bf5 is more common but I have some good Deep Blue prep on this move, even if it is fourteen years old. At one time this was just considered dubious because Black gets to develop his QB. But it's not so simple; with the bishop on g4 instead of d7, it will be more difficult to slip out of the pin after Bf1-b5. 5...Bg4 6.Bb5 Qa5+ 7.Nc3 e6 8.Be3 Nge7 9.a3 0-0-0 !? I had some ideas with this move from coming across it in a similar position. The queenside is of course not ideal for the king, but by breaking the pin Black creates immediate threats in the center. I think this move is inaccurate. 10.b4 Bxf3 11.gxf3 Qc7 12.Bxc6 (Not 12.f4 d4) 12...Nxc6 and now either 13.Bf4 or 13.Bd4 with a double-edged position that looks about equal. 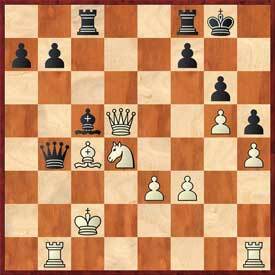 12.Qxf3 allows 12...Nxb4, which just looks bad for White, e.g. 13.0-0 Nxc2 14.Rac1 Qxc3 15.Qe2 d4 16.Rxc2 d3. I analyzed 13.b5 Qa5 14.Bd4 Nxd4 15.Qxd4 Kb8 16.0-0 Rc8 17.Qb4 Qc7 with a good position for Black. 17.c6 is probably a better bet; 17...bxc6 18.bxc6 Rxc6 19.Rab1+ Ka8 20.Nb5 gives White some play with the open lines. However, 14...Nxe5! was stronger (idea 15.Bxe5 d4) with advantage to Black. There are various ways of falling for the same tactic: 16.Qd3 Qxd3 17.cxd3 Nxd4 18.Nxd4 Bg7 19.Rxg5? Bxe5. I think Bryan was focused on the exchange sac after 17...Bh6 18.f4 and overlooked something here. 18.Qxd4 Qxd4 19.Nxd4 Bxe5 20.Rxg8 Rxg8 21.0-0-0 Rg2 looks like a depressing ending for White. It's cool to castle so late in the game, but this move doesn't quite defend everything. 21.Qc3 Bf4+ would be a trifle awkward. White's queenside pawn mass now disappears surprisingly quickly. Black will deliver a fatal check with the rook on the b-file or the second/seventh rank. San Francisco Bay native Sam Shankland made his Nor'easter debut against me in the third round. It was quipped on the USCL parody site that Sam was sent as a "player to be named later" to complete the trade that brought native New Englander Josh Friedel to San Francisco. Sam annotated the game on ChessCafe.com (pdf). I can't argue with his commentary on the whole, but there are a few points where I will have to disagree. Sam called this move "curious" and suggested 11...Nxc3 12.Rxc3 e5, but I know 13.c5!? can be awkward for Black there. With all due respect to Sam, I have a wee bit more experience than him in this opening. Sam was proud of this move which Rybka does not approve (it greatly values knights posted in the center by the way), but it is really quite normal and leads to typical positions. This is one of the ideas of 10...Nd8 of course. 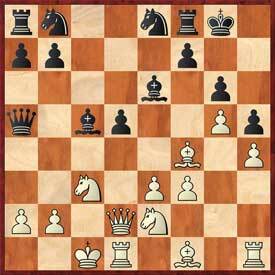 This move preserves the bishop pair, but there is a big difference between having this piece on b2 and having it clog up your development on e1. Though this move is also quite standard, it surprised Sam. His recommendation, 13...Bd7 14.Nd4 Nxd4 15.Qxd4 Bc6 looks reasonable, though not in my opinion preferable. It makes sense to prevent f5-f4, but this move creates a potential weakness of the f3-square. Black essentially has one extra piece to play on the light squares. I was concerned about 18.g4!? for awhile until I came up with 18...fxg4 19.Bxe4 Nxe4 20.Qxe4 c5 which I thought would recoup the piece or give me a huge attack. Then I turned on the chess engine, and Rybka laughed at my compensation after the nervy 21.Nb5 Bc6 22.Qxg4! 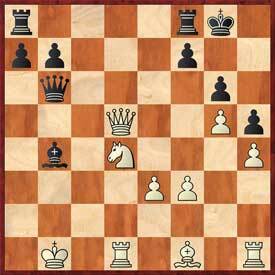 Bf3 23.Qg3 and White indeed does seem to possess a large advantage. Sometimes computers can be a real bummer. The move 18...a4! did come to my attention, but after 19.b4 Nb3 20.Nxb3 axb3 21.Qxb3 I didn't see the follow-up 21...b5! with equality. On 19.g4 I had the same idea as before: fxg4 20.Bxe4 (20.b4 Ng5 is strong--that one I did get right) 20...Nxe4 21.Qxe4 c5 but it appears not to work either after 22.Ne2 Bc6 23.Nf4. The right way is 19...Qxg4 20.f3 Qg5 21.fxe4 fxe4 with good compensation for the piece. I'm sure Sam was focused on the main variation; I don't know if he paid attention to these digressions. 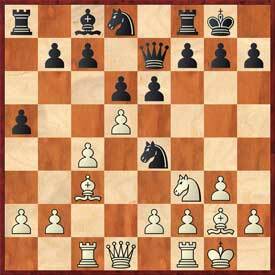 I was expecting 22.Qxe4, which Sam rejected because of 22...Bc6 23.Qh4 (23.Qxe6 Re8 traps the queen) 23...Qe2. 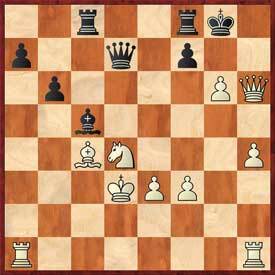 Rybka strongly advocates White's position after 24.Bxc6 bxc6 25.Qe4 Re5 26.Qxc6 Rf8 27.f4 (27.Qg2 is possible, too). I agree with Sam that White cannot rest easily in that position, despite the material advantage. Objectively, 23...Qxh4 is probably stronger; after 24.gxh4 Bxg2 25.Kxg2 Ra2 Black has a lot of compensation for the pawn. I didn't see 22...Bc6 at all. Sam suggested I would have come up with it because everything else just loses. But I didn't think matters were so clear-cut after 22...Ng5 23.Qxb7 Rff8. Probably White would play 24.f4 Nh3+ and now the best move is likely 25.Bxh3, as 25.Kh1 Ra2 offers a lot of play. Black's compensation is rather similar to what I got in the game, though obviously another pawn is missing. I'm just saying there are practical chances for Black. Neither of us had much faith in 23.Bxb7, but after 23...c6 24.f4 Ra7 White has the nice resource 25.Qg2! 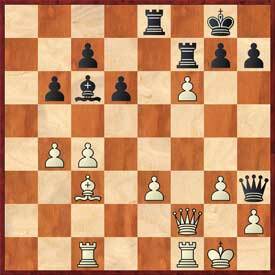 Still, Black can play the position after 25...Qe8 26.fxg5 Rxb7. I wanted to extend the diagonal to set up a battery. I didn't like 26...b5 27.cxb5 Bxb5 28.Rxc7, sacrificing the exchange to kill my threats on the light squares. As for 26...Rxe3 27.Qxe3 Qxh2+ 28.Kxh2 Rh5+ 29.Kg1 Rh1+ 30.Kf2 Rh2+ with perpetual check...I didn't see that either, though the match situation demanded I play for a win anyway. I saw he could do this but didn't think it helped him much. 28.b5 Bb7 29.Bd4 creates a more stable position that is probably roughly equal. One obvious mistake and it's pretty much over. 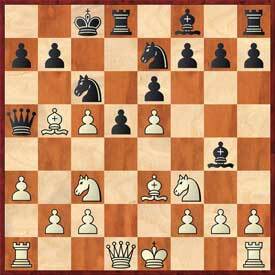 30.Bd4 keeps the position tense. Now Black has a simple plan of rolling the pawns through the center. Better to keep the rook trained on the c-pawn, but it's natural to look for counterplay. Rybka suggests 35...Qb3 here, but I wanted to keep things simple: coordinate my pieces and focus on the long diagonal. I spotted a trap here 38...d4 39.Rxc5 Rxf6 40.Qxd4 Qh3 41.Rf2! White could try 40.Be5 with the idea 40...d4 41.Rxb7 Qxb7 42.exd4, but simply 40...Ba8! leaves White in a big mess. There's no hope in 43.exd4 Qd5 or 43.e4 Rxf6. By the way, can the league stop scheduling the Knockouts to play on Rosh Hashanah? With a roster heavily of the Hebrew persuasion, we have trouble fielding a lineup. If my mom reads this blog she will not be happy I was pressed into service for this match. In the fourth round we were disappointed, and a bit stunned, to be held to a draw by the undermanned but gritty Carolina Cobras. They were a great Cinderella story a few years ago with a nice run to the playoffs, but the graduation of Lev Milman from Duke has been too much too overcome. Still, fair play to Ron Simpson for a determined effort against Gulko, and that Craig Jones dude just kills the Knockouts. Jon Schroer and I came up as juniors together and have done battle many times over the years. I'm glad to have the opportunity to play my old friend again thanks to the USCL, which enables a lot of old hands to keep active in the chess community. Schroer doesn't play much these days outside of the USCL, and he varies his openings pretty well. Still, I saw this move in the database and decided to look at it a bit. I was inspired by some of the beatings Kasparov dealt Karpov in their last rapid match. Karpov opted for 6...Bd6 here. It's dangerous business to castle so quickly when White is poised to storm the kingside. Black often plays 9...h5 here to keep White from advancing. Black might even castle queenside later. Schroer's last move anticipated my kingside pawn storm, but I was not deterred from my plans. Black's central advance destabilizes his center, which will be even more vulnerable after his knight is driven from f6. Rybka claims White's advantage increases after this move, but if Black allows 13.h5 the potential open h-file could be deadly. Schroer thought for a while here, looking for a way to minimize his troubles. 15...Nc7 walks into 16.e4, e.g. 16...Qc8 17.Kb1 Rd8 18.Bxc7 Qxc7 19.Nf4 d4 20.Ncd5 with a big edge for White. 15...Nc6 16.Nxd5 Bxd5 17.Qxd5 Qb6 18.Qb3 doesn't offer Black enough for the pawn. 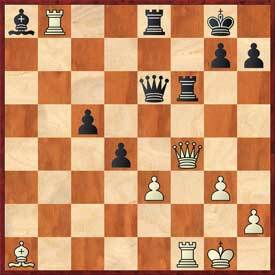 Probably best is 15...Qe7, as I determined midway through Schroer's think. Black indirectly counterattacks the e3-pawn. White has an edge after 16.Nd4, but with no immediate damage on the way. Now I had a long think. I played the second best move; I should have gone with my original intention, 16.Nxd5. I calculated 16...Qxa2 17.Nec3 Qa5 18.Ne4 Qa1+ 19.Kc2 Qa4+ 20.Kb1 Bf5, but after 21.Bd3, which I saw but misevaluated. White controls the center enough to provide a very large advantage. Black could hope for 16.Kb1 Nc6 17.Nxd5? Nb4 with a sudden turn around. I originally intended 17.e4 but felt Black had too much choice. I wasn't sure I could refute 17...Rc8 or 17...Rd8, and even 17...dxe4 18.Nxe4 Qxd2+ 19.Rxd2 Bb6 is playable because the attempt at a forced win with 20.Nf6+ Kh8 21.Be5 fails because of 21...Nc6 22.Bc3 Nb5. White is certainly better after the simple 20.N2c3, but how much? Finally I could keep a clear edge with 17.Bh3, but when I'm trying to force a win I often forget about simply developing my pieces. Black has to offer the sacrifice because otherwise White will take the d-pawn next move. I could still maintain a strong position with 18.Bh3, but I'm too stubborn for that. Played quickly for practical purposes, but other attempts don't seem to work. 18...Qxa3 19.bxc5 and now 19...d4 20.Nxd4! 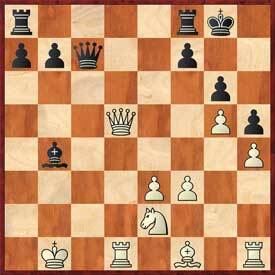 (not 20.exd4 Bf5+ 21.Ne4 Qxf3) and 19...Bf5+ 20.e4 dxe4 21.fxe4 Rfd8 22.Bd6 Qb4+ 23.Kc1 both come up short. My intention several moves earlier had been 22.Qxb4, but 22...Bxf3 is too awkward for White. 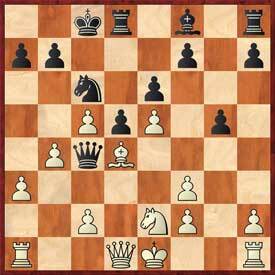 For instance, 23.Rg1 a5 24.Qd6 Be4+ 25.Ka1 Qc2 26.Bg2 gives Black, at minimum, perpetual check. This move came quickly and shocked me. My intuition told me Black has to start with 22...Rad8 23.Qb3 Rxd1+ 24.Qxd1 Rd8. Trading the rooks has to help Black; White loses a good defensive piece, while Black can bring the second rook right into the game. White's chances remain better, but anything can happen, particularly with the clocks running down low. 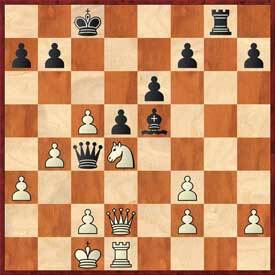 Having used so much time on the last few moves, I played this move before detecting all the nuances of the position. 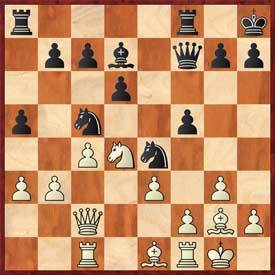 23.Qb3 offers cleaner consolidation, though Black has a nice trap: 23...a5 24.Nf4 a4 25.Nd5?? axb3! 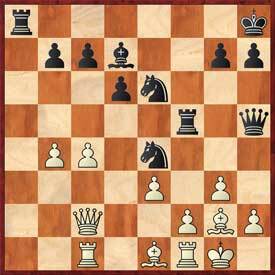 26.Nxb6 Bc3 27.Nxa8 Rxa8 and White will have to give both rooks to pull out of the mating net. It's a nice trick, and not the only one he's got. But instead 25.Qc2 leaves White well on top. The pawn on a4 even makes hiding on the a-file possible. Hiding in plain sight! White's centralized pieces will cover the king pretty well. I'm fortunate Black cannot mobilize both rooks. If he takes the hit on my queen with 24.Rfd8, 25.Qb3 consolidates easily. Now 25...Rfd8 is prevented because f7 will hang. Still, Schroer battles on. No choice here-26.Kd3 b5! leads to big trouble. After this quick move it's all over. He had to settle for 26...Qxc4+ 27.Qxc4 Bxd4 28.Qxc8 Rxc8+ 29.Kd3 Bb6 30.Rhc1. 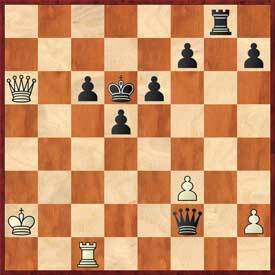 I don't think Black can do much with the queenside pawns with or without rooks, so White should eventually win on the kingside. 29...Qxe4+ 30.fxe4 would be an easy win for White. I would like to close with a thought on the game of the week judging in the USCL. I don't want to dump on anyone here, because judging is a thankless task. This is especially true on the Internet, where many people have the access and nerve to berate people at will. I have noticed that almost any upset seems to garner lots of points from the judges, but a grandmaster can only win by beating another grandmaster. I thought my wins over Smith and Schroer were superior games to the upsets of Gulko by Bartell and Simpson, respectively, but the judging did not reflect that. Just my opinion. Follow the US Chess League at uschessleague.com and on the Internet Chess Club. Tomorrow, on Wednesday September 22nd, the New Jersey Knockouts will face the Boston Blitz. Also see the New Jersey Knockouts blog.